Traveling and learning about new cultures is one of the greatest joys in life. But, while travelling can be an incredible and life changing experience, the actually physical “travelling” can be exhausting and have less than stellar food choices. And while my diet has changed drastically over the years; eliminating meat, dairy, tons of “convenience” foods, the need to stay well fed on planes has not changed. Having been on MANY planes in my day I have fine-tuned the foods that work for me, what keeps me energized, full, not swollen, what passes through security, and what makes other plane dwellers slightly jealous. 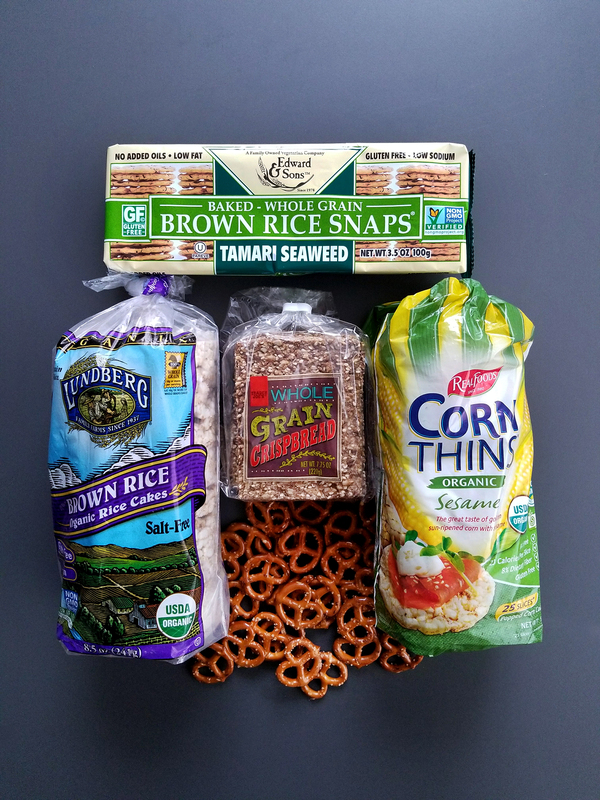 My go-to plane food essentials rely on pre-made snacks, dehydrated foods, and cooked starches. But before we get into the food, l wanted to talk about two essential must-haves while travelling on a long flight. 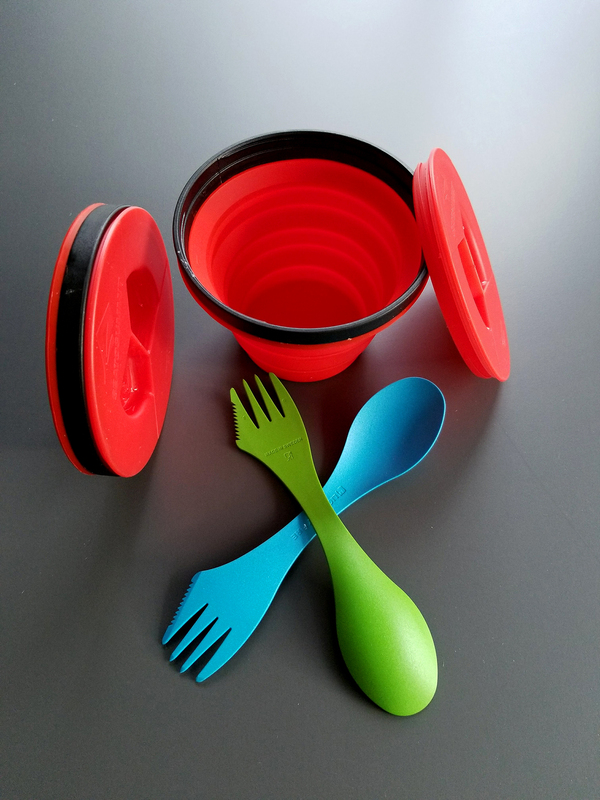 A Collapsible cup + Plastic Spoon/Fork/Knife I cannot emphasize enough how bringing this little thing on planes has changed my food game. They are small and out of the way, and you can reuse them as many time as you want. I got ours at REI, as they are great tools to take camping, but I believe you can also get them at places like Target and Walmart. Now let’s get into my favorite foods to bring on a plane. In the past, if I had time before a flight, I would always try to find the closest Starbucks and immediately order three oatmeal’s for my husband and me. 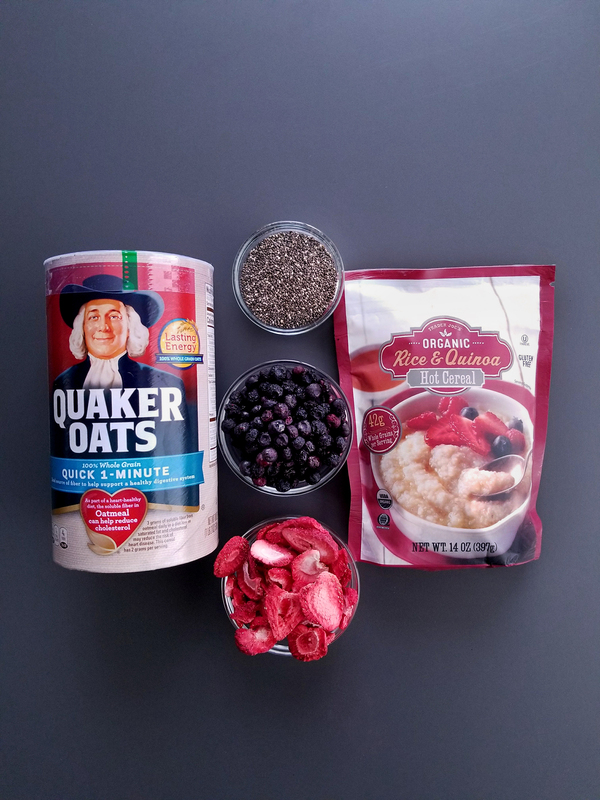 While it worked in a pinch, sometimes I did not have enough time to get something, or if I did I was left with a giant pile of trash from all the individual packages of toppings for the oats. On one of those sad and angry plane rides I realized that I could easily pack my own oatmeal and ask for the hot water from the flight attendant. That’s when the light bulb went off. Not only can I make my own, I can make a real portion, add only the additions I wanted, plus extra packed nutrition like ground flax seeds or chia seeds. Plus, I didn’t have to worry about having cold oatmeal that I bought before the plane took off. I could have hot oats, whenever I was ready. 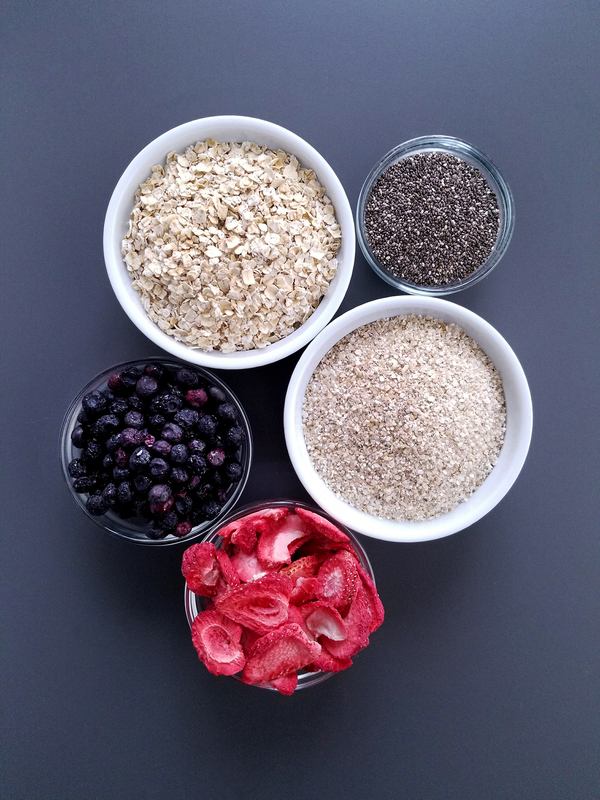 I just portion whichever cereal grain I want with some freeze-dried fruit, and some flax or chia seeds and DING….that was me pushing the flight attendants button, waiting for my piping hot water to make my breakfast. So, while the rest of the plane is smelling like bacon and eggs (which you know was cooked weeks ago) I am enjoying a healthy, hearty, delicious, and filling meal in my super cool cup, like a boss. 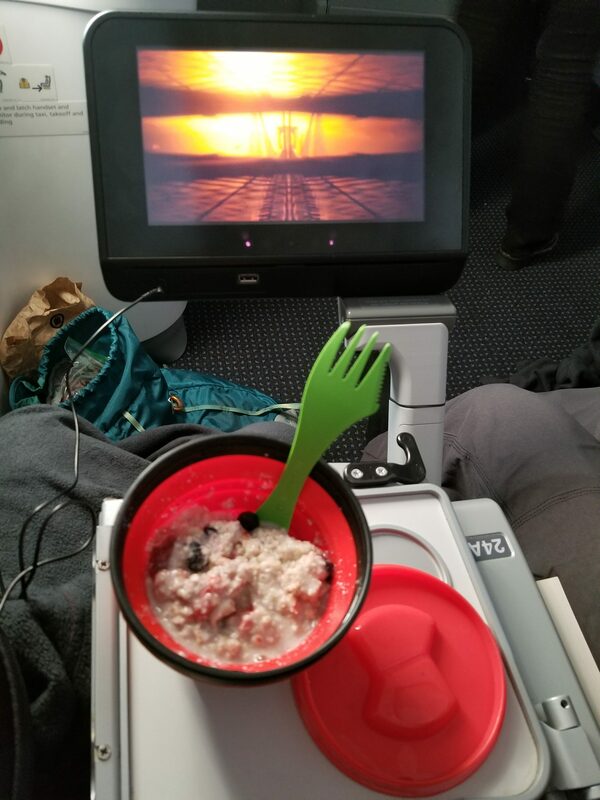 But the collapsible cup is not just for delicious oats, once you are done with breakfast, and have read some of your book, done some work, and watched your guilty pleasure in-flight romantic comedy you are ready for your next meal. How about delicious noodles? Split pea soup? Mashed Potatoes? You can find the instant version of these at your local grocery store. My particular favorite are the Dr. McDougall noodles and soups that come in a Cup-o-noodle style container. One of the reasons I love this brand so much is that the sodium levels are SO LOW, compared to most instant noodle brands. These obviously are very bulky, so I empty the contents of these containers into a small bag so that they do not take up as much room in my carry on. 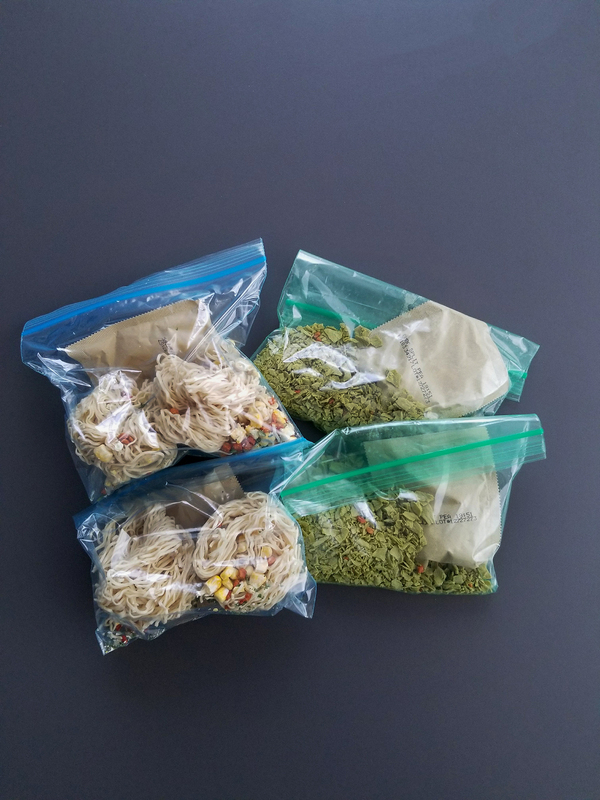 I normally buy two and put both dried noodle bundles and one flavor packet in one bag, and that would be one portion. It’s a wonderful way to get a lot of filling starch without the excess sodium. 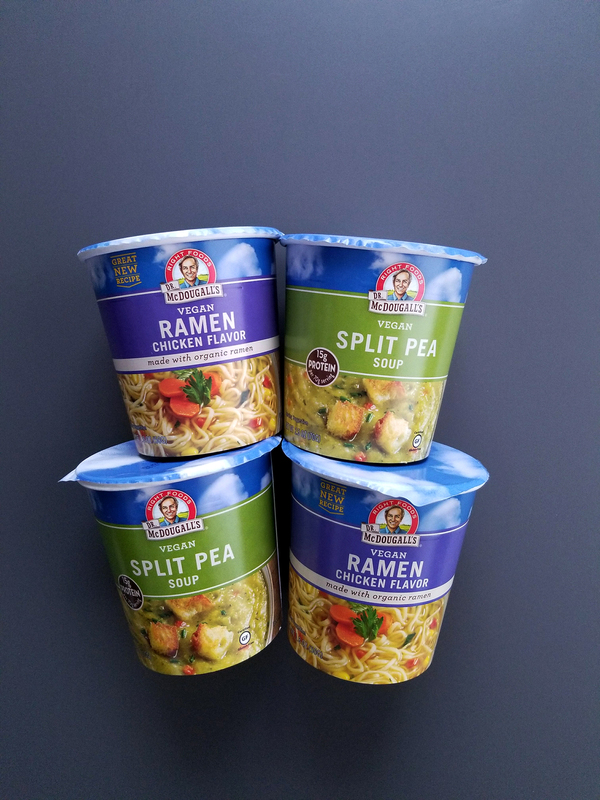 If you don’t want noodles, the bean and pea soups are amazing. And if you want to go old school, you can buy instant mashed potatoes, pack it in a bag with some garlic powder, onion powder, and dried chives, and you have a hearty bowl of taters. If you want to get really fancy you could even bring some cous cous, maybe with chopped sundried tomatoes and when its cooked, mixed it with a packaged of olives. Whenever I am ready I DING that bell and get more hot water from the flight attendant. And boom, we have lunch. 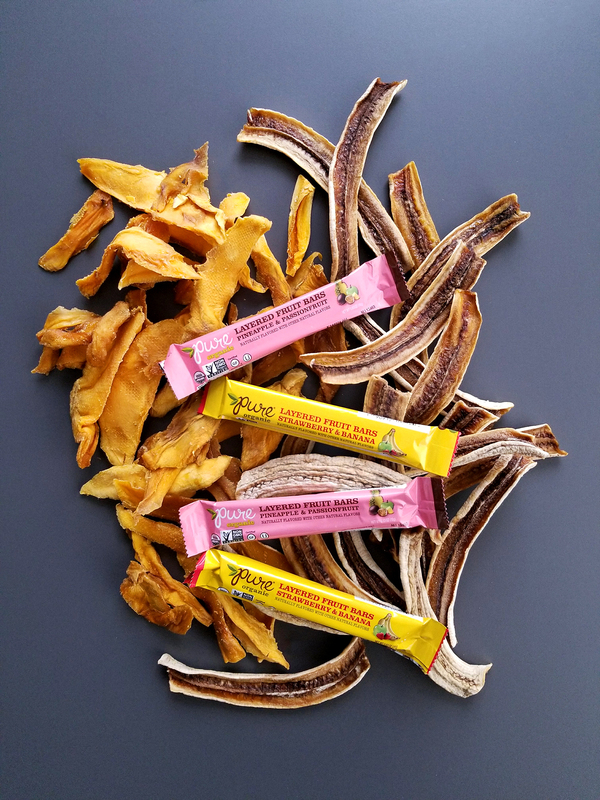 If you are not in the mood for a larger more filling meal and just want to nibble on something, I always pack dehydrated fruit. It’s sweet, and chewy giving your mouth something to do if you are bored on your flight and need to entertain yourself. My favorite are dates, dried bananas and mangoes, but you can pack any dried fruit of your choosing. I got a legitimate dehydrator for my birthday a few years ago and I LOVE making my own fruit leather and dehydrated fruit. It is so much cheaper than buying dried fruit and it fills your house with the most wonderful smells. If you have enough room in your pack to carry a few apples or bananas on board I highly recommend it. If you have ever received fruit from the plane (not in first class) it is never very good quality. Especially if you get the classic mealy red delicious wrapped in plastic….blehhh, or the green unripe banana in a bag…. more bleehhh. Having your favorite apple (organic if possible), or ripe banana will hydrate you and give you a good source of fiber. 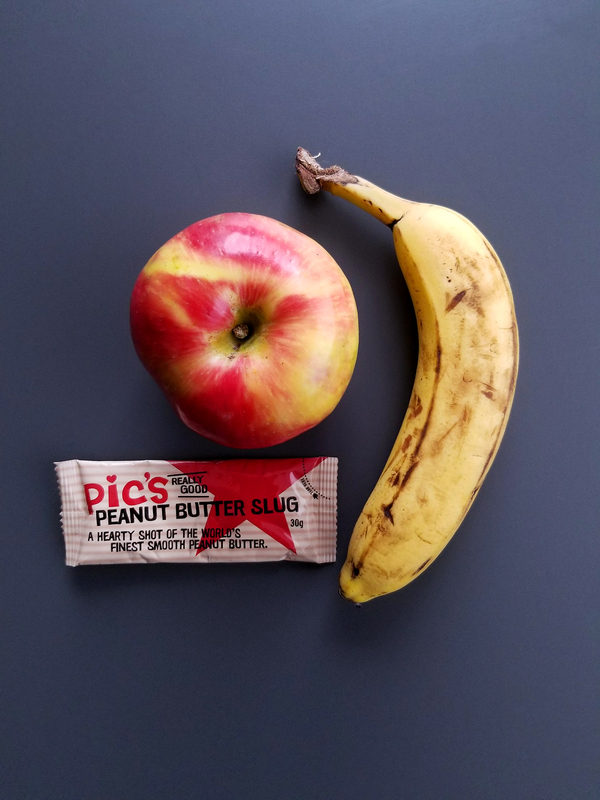 If you don’t like eating fruit alone, you can pack individual packets of your favorite nut butter to pair with your fruit. Try to find ones that have no added oils, if you can. You can also pair your apples with dates, one of my favorite combos. Let’s say you didn’t want fresh fruit and your flight covered lunch and dinner, so you want to enjoy a more savory dish. Pack your Spuds! 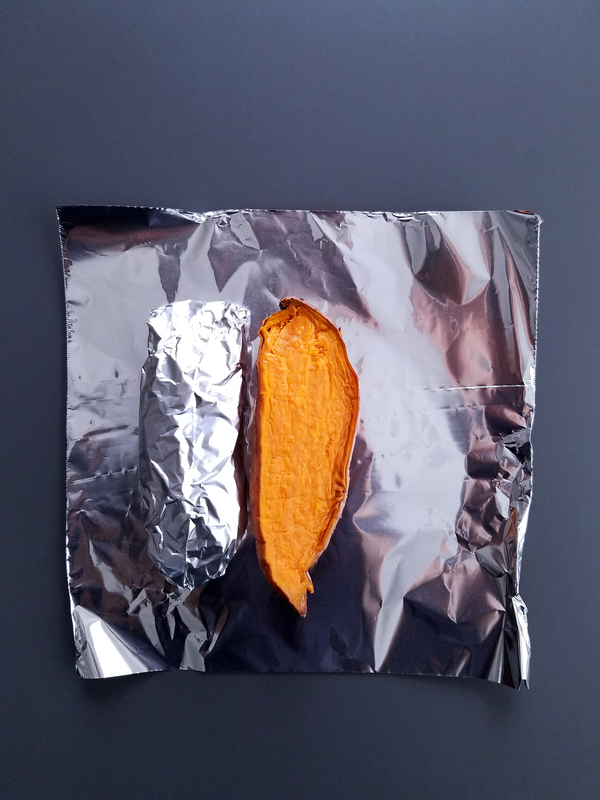 I have received many a double take turn from the lucky passenger sitting next to me when I have pulled out a couple of hot potatoes wrapped in foil, with my travel size sriracha. And every time, I get “wow, what a great idea,” unless I’m sitting next to a super paleo person then I just get glared at. Potatoes, yellow, white, and sweet are so satiating and make you feel good, plus they are a terrific addition if you can only eat parts of the given plane meal. The meal might come with steamed vegetables and a salad, add your spud and you have a meal you can work with. 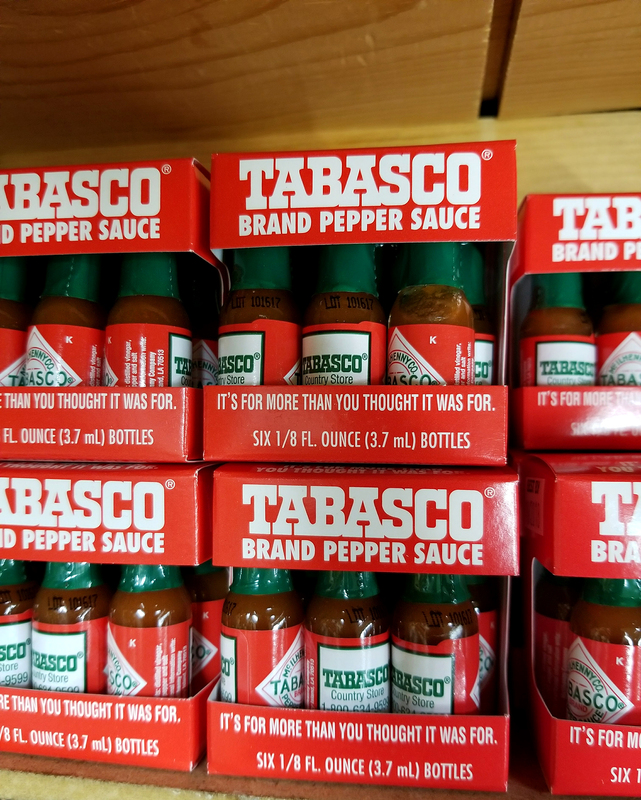 If you travel a lot I would invest in these tiny sauce packets, or you can hit up one of the restaurant in the airport for a package of soy sauce, ketchup, sriracha, or mustard, whatever floats your boat! Sometimes you just want something crunchy to chew on. You may not even be hungry, but the sensation of something crisp is always nice on the taste-buds and seems to help time go by faster. My favorite crunchy snacks for airplanes are lightly seasoned crackers, pretzels, rice cakes, and seedy crispbreads. If you are bold enough and have enough space in your bag you can also carry on a whole avocado. Pray that it is ripe and not spotty and slice that baby open to use as a “dip” for your crunchy snacks, maybe add some of your tiny sriracha…sounds good to me. Now I try to eat as “clean” as possible when I travel knowing that when I get to my destination I will be enjoying all of the wonderful food of that new place with abandon. These treats are for my husband, Liam. When I asked him what he wanted for snacks for our trip to Japan he responded with “the usual… chocolate, trail mix, something with peanut butter, and more chocolate.” What can I say he likes what he likes. 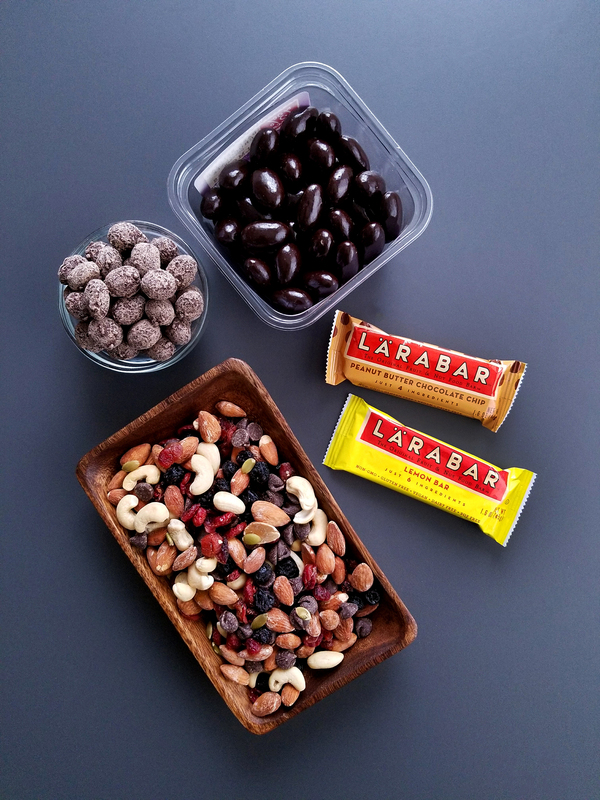 So, I try to pack a small amount of more indulgent snacks like chocolate covered raisins, coffee sea salt chocolate almonds, homemade trail mix, and his favorite Lara Bars. 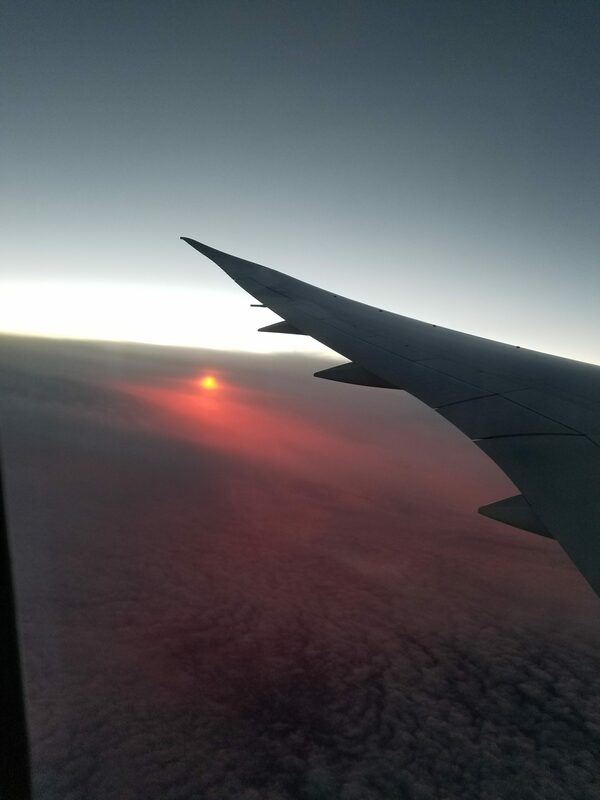 And finally, one of the most valuable things to have while up in the sky, is something to ease your nerves, and possibly your stomach. A lot of people like to use alcohol to “calm down” while traveling but in my experience, it only makes you feel worse, more dehydrated and groggy. 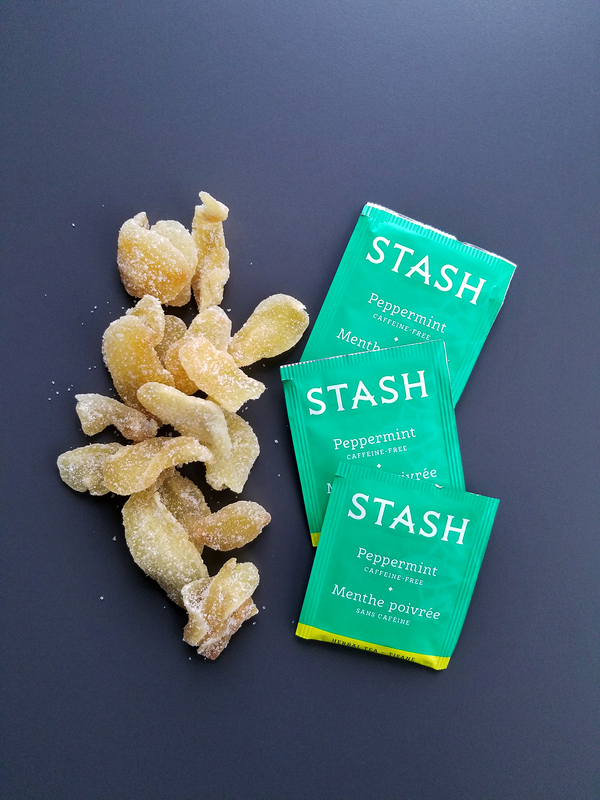 Personally, I always packed a small bag of crystallized ginger if I ever have an upset stomach, or just want to refresh my palate. I have also found that you can steep the ginger like a tea and create a wonderful hot beverage to help ease digestion and nausea if you are not feeling well. Peppermint tea is another one of my go-to favorites, to cleanse my palate and to wind down after a big meal, or right before I know I need to catch some sleep. It calms me down and gets me ready to rest. Depending on how long your flight is will determine how much food you bring, but I always say it’s better to have to many snacks than to be hungry. You can always keep them for your hotel room or give them away to others on the plane. 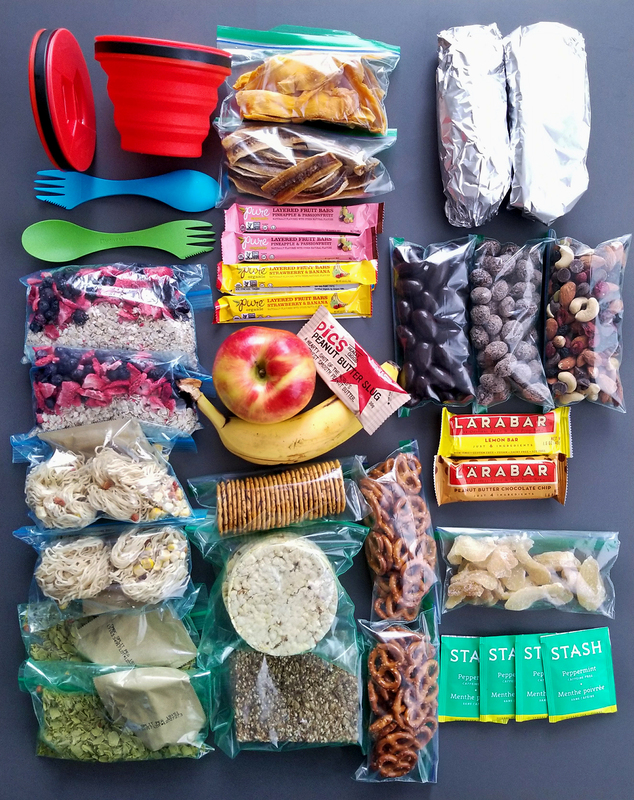 I hope this inspired you to take more initiative in packing healthier meals for your next big trip.